The Authenticity Experiment, the early morning drive edition. Just five days after I’d won the Oregon Book Award, I still floated somewhere above my body. Or, if I inhabited my skin sack (thank you, Lidia Yuknavitch for that evocative phrase), my brain and emotions lingered somewhere else. You know what I mean, you do—the way your body refuses to inhabit a truth. An award for my book? Totally unbelievable. And at 7:30 a.m. that Saturday, I drove my alien green Kia Soul on the two-lane road through the blooming vineyards and orchards of Yamhill County, on my way to the McMinnville campus of Chemeketa Community College for the Terroir Writers Festival. 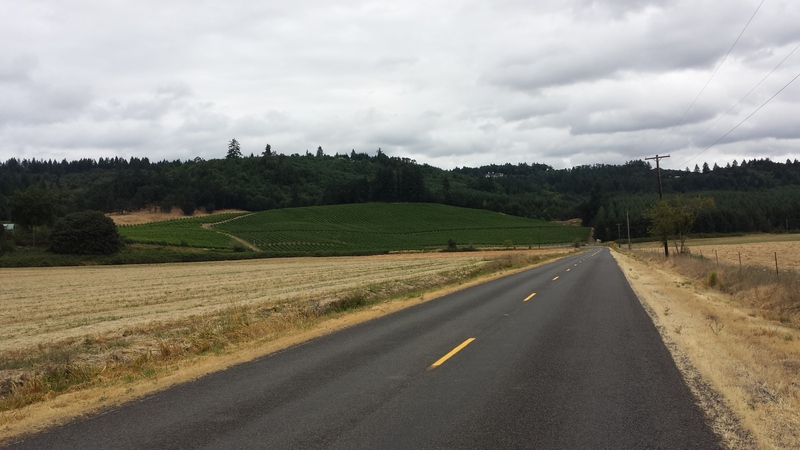 Terroir because from Yamhill County comes some of the world’s most award-winning pinot noir wine. Terroir because the soil creates a writer’s flavor, too—her voice, her obsessions, her lens on the world. The early spring sun sat low still, just clearing the tops of the hazelnut trees, infusing the blonde grasses still hanging on to the past fall’s die off with a satisfying golden light. My second Ame ricano, purchased 45 minutes earlier in St. Johns, still held some warmth and, more importantly, caffeine. I took a long draw on the lukewarm brew and, if I know myself, I sighed after that big swallow. Sighed because of the light, because early morning rides with both heat and music blasting remind me of my band and the back roads and small towns we traveled to all those summers ago. I wanted to call The Woman Who Was Not My Girlfriend and describe all this to her. But, it seemed early—literally and figuratively—we’d only known each other a month. And also, the music, the light, the early morning drive, I’d rather she simply sat beside me in the car, my right hand resting easy on her left thigh. I could imagine us sipping our respective coffees, not talking because of the bucolic yet grand scenery, not talking because of nerves and because of the newness of this relationship? friendship? we both felt ambivalent about. But then the music paused and her name appeared on my car’s Bluetooth screen. Hey, I said, and I’m certain she could hear the smile in my voice, I was just thinking about you! What are you doing up so early? I don’t remember her answer or what we talked about. Like I said, we’d truly met less than a month earlier, talking in passing at a party once a year earlier, but then meeting to talk about writing over coffee. At the end of that epic four hour-long coffee, where the Woman Who Was Not My Girlfriend asked about writing her own story and where and how to start, I said, Well, I sure hope you’re a good writer because you’re a great storyteller. She didn’t disappoint on either front. Spinning tales of her family and getting them down on paper. Maybe that Saturday morning we just told each other stories or maybe we talked about the Oregon Book Award and my next steps. I just remember feeling glad to hear her voice and amazed at the synchronicity of her calling right as I wished for her. Then suddenly I was pulling into the parking lot of the college “campus” which was really just a new, four-story building in the parking lot of a one-story suburban strip mall, and saying goodbye to the Woman Who Was Not My Girlfriend. I’m sure she told me to “Knock ’em dead” because I’d confessed my nervousness about teaching. It’s been almost a year since I’ve spoken to the Woman Who Was Not My Girlfriend and I’m better at forgiveness than I used to be, which means even with all the bitterness and badmouthing and the ostracism, even with all that—if it were Saturday morning and I found myself driving through Yamhill County and the sun shone at an impossible angle through the grapevines or the nut trees, and the high treble of Patty Griffin’s guitar and voice on “Useless Desires” wafted from the five speakers in my car, and if a lukewarm triple, tall, one-third decaf Americano with light cream sat in the cupholder between the black cloth front seats—I’d still use my left thumb to press the “phone” button on my steering wheel and answer the call, saying with more leeriness in my voice this time, Hey, what are you doing calling me so early? Or maybe just, Hey, why are you calling me? I don’t know if it’s a fault of mine—maybe a lack of self-preservation—this always trying to dig up resolution in relationships, even in ones that are not good for me. I used to believe it an admirable quality, this twisting and turning of myself to try and “fix” broken relationships, but as I write this, I realize I’m not so sure. Because what the fixing has meant is that I re-release the harmful nutrients from the landscape of my childhood, and I’ve worked on growing out of those for 30 years now. Now, I wonder if letting people go might make more room for—if not new friends—at least new ideas about self and self-worth to sprout in soil of myself. I wonder if driving alone through Yamhill County and thinking my own thoughts isn’t just exactly what I need most Saturday mornings in the spring when the sun rises just above the hazelnut orchards and Patty Griffin is singing and ending her songs on a sixth note or a seventh note, ending her songs on a chord with no resolution. Hey, I’ve heard from so many of you that you like The Authenticity Experiment: Lessons From the Best & Worst Year of My Life. If you’re so inclined, would you please leave a review of the book on the platform of your choice? You can even leave the exact same review on Goodreads and your favorite bookselling sites. Every review truly makes a difference. Thank you! This was exactly what I needed to hear today. Thank you for the reminder that letting people go is sometimes the best thing we can do for ourselves. and consider, finally, on that drive between water and mountain, the possibility, as you state so aptly, that by letting go, I can not just “sprout in soil of myself” but thrive. It gives me comfort that I am not the only one on the path of “becoming” and thank you for articulating so well how it feels to be on the journey.